Meguiar's® Hybrid Ceramic Wax, 26 oz. Simply spray on, rinse off & dry! $5 OFF Digital Rebate. Act Now! Limited time offer! See details below. Do you want an easy to use car wax that with cutting-edge, sophisticated technology that delivers the latest in protection? Meguiar's® Hybrid Ceramic Wax is the answer. With all-new, advanced Si02 hybrid technology you get ceramic protection that's so easy to use, you can actually wax your paint as you rinse off your car! After washing & rinsing off the soap, simply spray on Meguiar's Hybrid Ceramic Wax and then follow that with a second rinse with a strong stream of water. 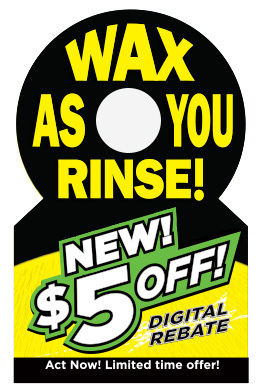 This final rinse helps to spread and lay down the wax evenly for you. Dry your vehicle like you would normally with a quality microfiber drying towel, like Meguiar's® Microfiber Water Magnet™ Drying Towel. There’s no rubbing or buffing and there's no curing time. You're left with ceramic protection and durability well beyond conventional wax and extreme water beading protection. Conventional? No. Sensational? YES! It's Ceramic made easy! TO RECEIVE one (1) $5 REBATE, log on to https://meguiars.us/CeramicWax5. Enter offer code MEG2019HCW and complete the rebate information, including an image of your receipt for a purchase of Meguiar’s® Hybrid Ceramic Wax on a store-identified cash register receipt. TERMS & CONDITIONS OF MEGUIAR'S $5 OFF HCW REBATE OFFER:Offer valid only on 26 oz bottles of Meguiar's® Hybrid Ceramic Wax purchased from participating retailers between 01/01/2019 and 12/31/2019. Cash Register/Purchase receipt must show purchase of a minimum of one (1) Meguiar's® Hybrid Ceramic Wax (G190526) to receive a $5 rebate. Rebate offer not valid on the purchase of any other Meguiar's product. Log on to: https://meguiars.us/CeramicWax5. Enter offer code MEG2019HCW and complete the rebate information, including an image of your receipt for a purchase of Meguiar's® Hybrid Ceramic Wax on a store-identified cash register receipt to receive YOUR rebate. Full offer rules available at https://meguiars.us/CeramicWax5. Offer open to legal residents of the United States and the District of Columbia who are age 18 years or older. Limit one (1) $5 rebate per household. Rebate checks not cashed within ninety (90) days of issuance are void and cannot be reissued. Please allow 8 weeks for rebate check delivery. Be sure to keep a copy of all materials of the rebate submission(s) for your records. Rebate offer subject to all federal and state laws and restrictions.